MIAMI -- The bases were clogged with Marlins, just as they had been for most of a gray afternoon, when pinch hitter Mike Jacobs lofted a two-out popup about halfway down the first-base line. Sweet relief? From the safety of the winning clubhouse, that was an easy assumption to make. But there was a moment, Red Sox setup man Mike Timlin said after yesterday's 4-3 win, when he had his doubts. Especially when he glanced toward first base and saw that David Ortiz, the accidental first baseman, hadn't exactly reacted with the crack of the bat, and catcher Jason Varitek had remained at the plate. Timlin also was operating with prior knowledge: Earlier in the game, Ortiz dropped a popup in front of the Marlins' dugout for an error, not exactly an inducement for Timlin to relax as this play unfolded in the seventh inning of a tie game. ``When the ball went up," Timlin said, ``I knew Ortiz was playing back. I kind of glanced over there and he wasn't really moving extremely fast. I knew it wasn't real high, and 'Tek wasn't moving. When 'Tek didn't really come after it, and it wasn't really very far from the plate, I just went and called it." That's when second baseman Mark Loretta, whose sacrifice fly the next inning would score Alex Cora with the go-ahead run, noticed Ortiz gaining speed and braced for the worst, according to Timlin. ``I talked to Loretta afterward and he said, `I was afraid you were going to get run over,' " Timlin said. ``I said, `Dude, I weigh 240. I'm only giving away about 20 pounds.' "
There would be no collision, and no error, either, Timlin making the catch while staying out of harm's way. Ortiz, however, can kiss the Gold Glove goodbye, according to Cora. ``He's done," said Cora, who scored the winning run after reaching on an error and taking third on Gabe Kapler's hit-and-run single. ``The only DH I know who won a Gold Glove was [Rafael] Palmeiro. ``Now David's made an error," Cora added. ``No chance." For now, Ortiz can put away his glove, as interleague play is over for the summer. Never have the Sox been so sorry to see their National League brethren depart: The Sox, who have now won two straight after the Marlins broke their 12-game winning streak, finished 16-2 against NL (ahem) competition, tying the season record for most wins accumulated in 10 years of league-swapping. Yesterday, with Jonathan Papelbon setting a club record for saves by a rookie (25) on the same day his peers voted him to the All-Star team, the Sox won the rubber game of their set with the Marlins despite being outhit, 9-5, making more errors than the hosts, 2-1, and stranding only two base runners to 13 for the Floridians. 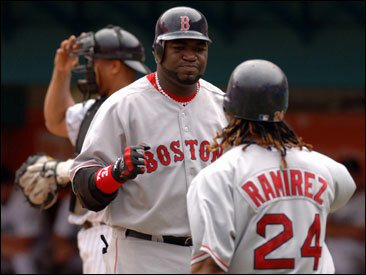 You can overcome such disparities by hitting the ball out of the park, which the Sox did three times against the Marlins' best young arm, Josh Johnson, who had given up just three homers all season but was taken deep by Kevin Youkilis (leading off the game), Jason Varitek, and Ortiz, one in each of the first three innings. Ortiz, who hit three home runs in two days and came within a couple of feet of two more this weekend, has 26, one fewer than Jim Thome, who has homered in each of the last two games to keep ahead of Big Papi. ``This was a tough game -- this is not an easy place to win," said Loretta, whose 13-game hitting streak could not have ended on a more productive note, his fly to left off reliever Randy Messenger having plenty of distance to score Cora. Loretta, who learned before the game that he had been voted an All-Star by the fans (``I'd never been on the radar before," he said), delivered after Miguel Cabrera had tied the score in the seventh with a home run off Julian Tavarez, who'd preceded Timlin. The Marlins scored their first two runs off rookie lefty Jon Lester, Hanley Ramirez duplicating Youkilis's feat of leading off the first with a homer, and Miguel Olivo singling home a run in the fifth. It could have been a lot worse, as Lester did not have a clean inning in the five that he worked. But when he wriggled out of a bases-loaded, no-out jam in the second, going shallow flyball, popup, flyball to escape unscathed, Lester not only kept the game in hand but showed once more why his elders are so excited about him. ``He's already doing a good job of not letting things snowball," pitching coach Al Nipper said, ``because he has the stuff, and with more know-how and experience, he's going to learn how to do it quicker and better." The kind of know-how and experience exhibited by Cora, who started at short in place of Alex Gonzalez and reached safely when Marlins second baseman Dan Uggla bobbled his eighth-inning grounder. Kapler, who had replaced Coco Crisp in center an inning earlier as part of a double-switch with Timlin, followed with his single, practically throwing his bat at a pitch that was down and away as Cora took off. ``Oh yeah, I knew he was going to make contact," Cora said. ``We work on that every day." Which is more than you can say about pitchers practicing catching popups. ``I've never understood that taboo," Loretta said. ``Pitchers are athletes. They can catch the ball." Timlin agreed. ``I'm a professional shagger," he said.